Under the banner of "Awakening Humanity," the Indian state of Kerala will soon witness a massive campaign or Keralayathra (yathra meaning "expedition" in Malayalam, the local language.) This religious journey will led by the traditional Sufi Qamarul Ulama Sheikh Aboobacker Ahmed, known to the Muslims of Kerala as Kanthapuram A.P. 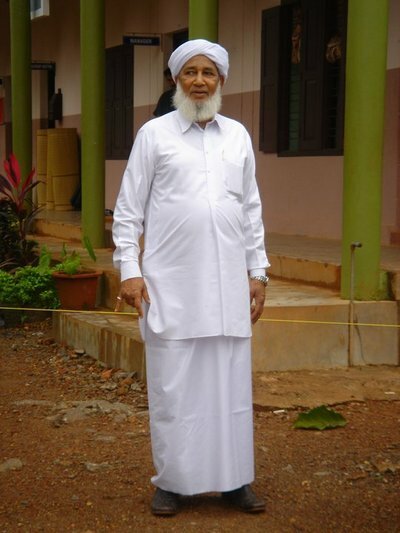 Aboobacker Musliyar, and general secretary of the All-India Sunni Jamiyyathul Ulama. Bearing his great humanitarian message, Sheikh Aboobacker is expected to commence his itinerary on April 12 and to conclude it on April 28, delivering a luminous lesson in the history of a human being. The extended agenda, covering 60 large conference assemblies, is unquestionably significant at the dawn of the new common millennium. Sheikh Aboobacker's actions now, to reconstruct the devastated pillars of humanity, were manifested in centuries past by the great prophets of Almighty Allah. The meaningful statement of Prophet Muhammad (pbuh), "the scholars of Islam are the heirs of the prophets," indicates that the essential duties and obligations of religious leaders must be fulfilled, irrespective of the opposition they face. Main Building at Markazu Ssaqafathi Ssuniyya, Kozhikode, Kerala, India. The Keralayathra march has been criticized blindly and baselessly by Wahhabis and other radically-minded minorities, although the observance has gained support from all sectors of society. The inevitable necessity of awakening humanity is continuously underscored by the disconcerting news, shocking to all humankind, not merely from distant regions or a single corner of the world, but from almost every country. Sensationalist media awaken us very early each morning with ugly images and horrific reports of bombings, robberies, sexual crimes, kidnappings, territorial disputes, and other signs of the stress on humanity's limits. And nobody can deny that behind the glitz and glamor of the current digital and global world order, which claims invisibly an eternally pleasant life to those who come forth to swim rapturously in this fantasy, there lies a vast and barren desert in which the majority of people claw to survive. Today, while many among us firmly believed that science and technology would provide comprehensively the gifts for which morals craved, heinous and dangerous evils accompany the benefits of each. The impact of both depends on uses and misuses; but unfortunately, as we see clearly, the bad overwhelms the good. The most valuable aspects of the human relationship – affection, reverence, generosity, tolerance, patience, etc. – in which the human race struck its deepest roots, seem to have disappeared from the lexicon, to be silenced by deceit, unbridled ambition, treachery, and murder. Images of those devastated by the storms of imperialism continue to appear before our eyes while their cries reverberate in our ears. Schools are built, less for the goals education formerly offered, of raising children to the pinnacles of a cultured and civilized life, but to realize personal self-interest through business. Those who study in them are taught to exploit and amass wealth. It is therefore at this critical moment in contemporary world history that Sheikh Aboobacker Ahmed will once again begin his marvelous expedition. This should certainly erase the fallacious dogma holding that Islamic scholars or Sufis need only sit within the four walls of a shrine. Sheikh Aboobacker has made similar and memorable sojourns, which were more than mere visits, to Jammu and Kashmir, and to Gujarat. These are not brief stopovers. Apart from the main expedition through 60 major cities, an accompanying effort, called "upa yathra," will pass through no less than 500 towns ahead of Keralayathra. Such organizations as the Sunni Students Federation are committed to the full success of Keralayathra. Islamic scholars from elsewhere in India have called on Sheikh Aboobacker to extend his range throughout the country. Already, Keralayathra is a milestone in Indian Islamic history.